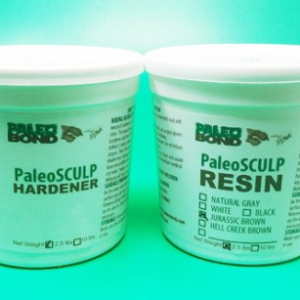 PB4418 is a special fossil consolidate that was designed to be used in the case of a fossil that is of good quality but encased in very hard matrix and having an interior of soft, punky,vascular bone structure, like some Tyrannosaurid bone material. 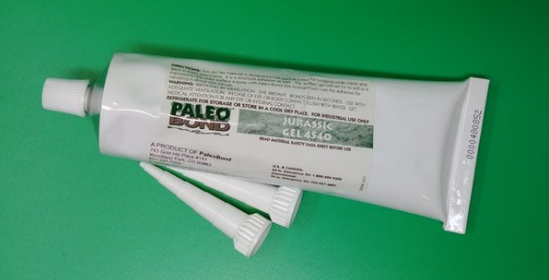 PB4418 was developed to fill in and stabilize the interior of the bone. Gently drill a 1/4” hole through the matrix into the fossil interior. Then, pour the PB4418 into the bone cavity. A secondary vent hole will assure complete filling. 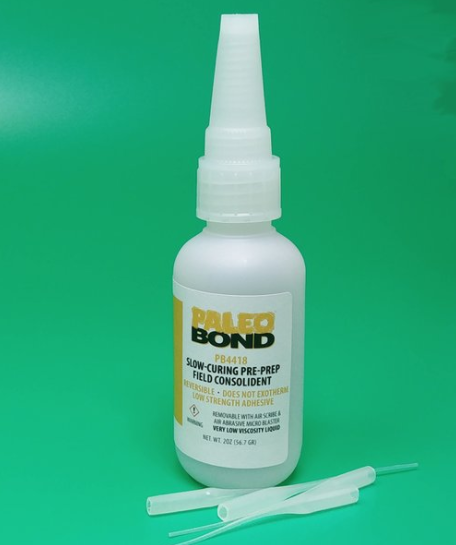 PB4418 can also be applied to any open, exposed interior bone through visible cracks or gaps to maximize penetration by the consolidant. Later, in the lab, these fossil parts can be cleaned and carefully reassembled. 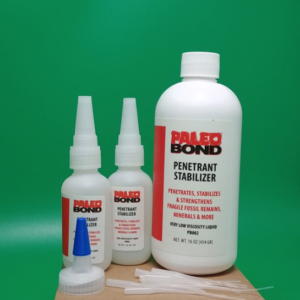 PB4418 is a LOW strength penetrant stabilizer that was designed to cure slowly without any exothermic reaction so as to prevent heat cracking. Shrinkage is less than 1%. PB4418 is a REVERSIBLE adhesive. It can be mechanically removed using an air scribe or air abrasive blaster when back in the lab. The Kit includes: One 2 oz. 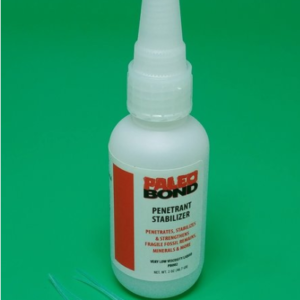 bottle of PrePrep Field Consolidant PB4418-02 with 4 microtips.